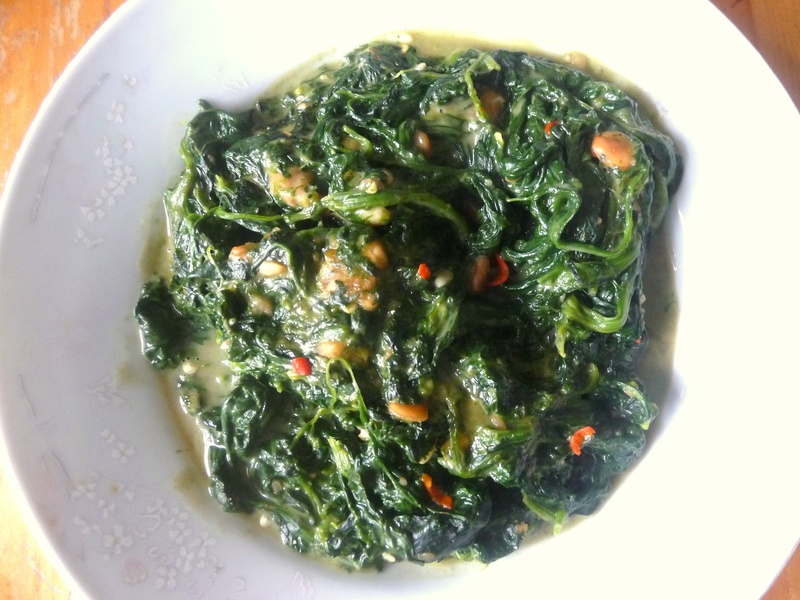 There are countless tasty things you can do with spinach. But there is only one – simple and yet easy to mess up – that will bring the best out of its natural qualities. And that’s, if to quote Eyal Shani, maybe the most peculiar genius in Israel’s culinary scene, when it is melting into itself. The idea is to take fresh spinach leaves, wet as if they were just picked up after a rainy day and introduce them to hot metal. Let then torch from one side until they surrender, then swirl them until they become soft. When they do, add some good olive oil that will create an emulsion with the liquids releasing from the spinach, preserving all the flavors in the liquids and also maintaining the great green color of the spinach. Once that’s done, we are basically ready to eat. Some upgrades, of course, are possible. A bit of minced garlic, right at the end, and then swirl in some freshly cooked pasta. A wonderful, minimalistic sauce. You can serve them as is, on a slice of toast, or on a foam of fresh tomatoes stained with tahina. If you really want to go crazy, forget the olive oil, and instead swirl inside some unsweetened and unsalted 100% peanut butter, minced fresh ginger and freshly chopped chilies. Best here would be red bird’s eye, these small and pointy peppers that smack your tongue with intense hotness for a second, and then disappear. Posted in Vegetable WitchcraftTagged Pasta, Peanut Butter, SpinachBookmark the permalink.